Generally, when you give a Presentation with the projector, the display content on the projector is the same as your notebook computer, this is very inconvenient. In the course of the speech, if you do any other works, for example, reading rough draft prepared for the speech, record ing the questions of the audience, the operations will all display on the projector. It will disturb the audience. Presentation Aide can help you to do the private works in your computer but just show the parts that you want to the audience. 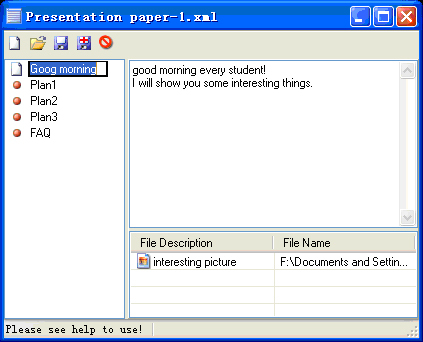 Presentation Aide is a tool, it can run in Notebook computer or PC which support dual monitor (in generally, most fashionable Notebook computer can support dual monitor). When you give a lecture or make a speech with computer and projector, Presentation Aide will greatly help you. The projector monitor can mirror your computer monitor synchronously , but, without something such as Presentation paper window and a Memorandum window. So, you can see something prepared in your computer monitor, but audience can not see them in the projector monitor! Presentation Aide also provide Screen Mark and Whiteboard function, it will take a best effect for your presentation! Please visit www.vaysoft.com for details! This site does not contain serial number, crack, keygen Presentation Aide for Windows XP serial number : serial number is the simplest type of crack. A serial number(cdkey,product key,etc) is register the program as you may already know. a crack or keygen may contain harmful software. If you cannot find the exact version you want, just give it a try. for more information read .nfo/.txt/.diz file include in zipped file.